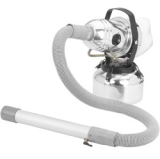 The Fogmaster Noz-L-Jet 7807 fogger features a hose and wand with discharge control. Lightweight and portable, it allows "spot" fogging without filling the room or wasting chemical. When you want fog, just aim the nozzle and press the thumb valve. It's spring loaded for one-handed operation, but can be latched "on" if you want continuous output. No matter what your task, the Noz-L-Jet's powerful 30 cfm blower does it quickly. First developed to apply germicides to air-conditioning ducts, the 7807 has proven useful for other "directed fog" applications including removing smoke odors from draperies and upholstery, applying anti-mildsew chemicals beneath carpets, and pest control in restaurants and commercial kitchens (treating wall voids, above ceilings and under appliances without filling the room with fog). Hose: 36" ; Wand 38" or 16"